Usually I love Aiken's books, but this left me cold. The big problem -- the unrelenting Boys Town aspect of the story. The deliberate and foregrounded misogyny against the (very) few female characters was unpleasant. And this is a book that probably passes the Bechdel test (I'm not going back to check, because ick). The story focuses on a train heading across England, to fight the monsters who have taken over. And while it is a train for males only, there are two female characters, one of whom is the cook, the other of whom is a little girl. Given that there is at least one scene with these as the only two in the kitchen, there was at least a conversation between them. Whether it was about The Men, I don't remember.I'm not sure if this was deliberately written as so horrible. But whatever the message was that it the author was going for has completely missed me. I finished it. Because I'm an obsessive story completer. Because maybe it got better. Because maybe the explanation for the world would make up for everything else. And I wish I hadn't. With the UK invaded and the population depleted by swarms of horrible monsters, the surviving populations has been forced to live in hiding. A Cockatrice Corp is formed to battle the menace, travelling the country on an armoured train powered by wind, solar and stellar energy and compressed diesel bricks. Drummer boy Dakin Prestwich is on board, and soon so is his cousin Sauna, along with her mysterious precognitive powers. Travelling first to Manchester and then to Scotland and the heart of the outbreak, fighting monsters every step of the way, can the Corp defeat the monsters once and for all?A brilliantly demented book that manages to be hilariously funny even as characters get devoured and vanished and turned to stone by the score. The premise is amazing, though, and the whole thing is fantastically entertaining. The publisher claims this is an adult fantasy but I don't know whether it is or not. The reading level is probably early high school but the story is a bit dark, but then there are some holes in the fabric of the plot that adults might want patched and kids might not notice. For instance, what they eat, and how they get it. And there are good illustrations, which seem to be aimed at kids. I really like the pictures. Dakin is drawn as a nerd with glasses and bad hair. Sauna has nice hair and a prominent nose, and both of them look lively enough to step off the page and into your room. I like the way everybody talks. And I like how much I got to like the characters.The only other Aiken I can recall reading is The Faithless Lollybird, a collection of short stories that the Carnegie Public Library shelved in the adult section. That one was weirdly good as well. This was okay, I enjoyed it, but but she has written much better books. Monsters attack the British Isles, but not the rest of the world. The monsters are fought by soldiers and two kids on a train traveling through Britain. Her explanation for the origin of the monsters that they somehow came through a hole in the ozone, and were directed by witches, just didn't seem to hang together, and I say this as someone who's willing suspension of disbelief is very powerful. It really felt like there was no reason to assume that all the monsters had been eradicated at the end, and yet all the characters did just that. It ended with a strong feeling that there should be another book after it. Still it was a fun read, with dome funny scenes. This scared me as a kid. I found it really creepy although reading it now (I reread it) it's not as creepy as I thought then. But it's good. The descriptions of the monsters were detailed in a not-boring way and (view spoiler)[the bad guys, save for the main bad guy, got their just desserts. (hide spoiler)] I just wished it happened sooner. The characters themselves were awesome, I loved everybody in the good side, especially the dog! :The slight downside is how quick things got to a close and the fact that some of the characters weren't mentioned enough to make me understand them fully. Still, it's something I definitely recommend! A charming, strange tale in which Britain is overrun by monsters previously thought to be imaginary. It has a definite sort of "War of the Worlds" flavor, with British soldiers complaining about the quality of the tea, then dashing off to perform heroic acts. It's billed on the jacked as Aiken's "first adult fantasy," but I would also recommend it to teens who like a touch of the bizarre. A solid story about fantastic and bizarre things that happen from a very stiff-upper-lip-cuppatea perspective. If Hitler had used demons instead of bombs, he still would not have won.One minor flaw? Global warming tie-in seems anachronistic and a hair preachy. This was an entertaining book, but it ended rather abruptly and with a bit less satisfaction than I'd hoped. I'd like to read Aiken's other work - I read The Wolves of Willoughby Chase about a thousand years ago and may need to revisit it. Joan Aiken - Joan Aiken was a much loved English writer who received the MBE for services to Children's Literature. Her most famous classic, THE WOLVES OF WILLOUGHBY CHASE has been in print for over 50 years with a new AUDIO recorded by her daughter Lizza. She was known as a writer of wild fantasy, Gothic novels and unforgettable short storiesW COLLECTION 2016 - The People in The Castle goodreads/book/show/2See NEWS & NEW PUBLICATIONS at facebook/JoanAikenOffFollow THE JOAN AIKEN BLOG at joanaiken.wordpress/For Joan's life and full Bibliography visit joanaiken/Joan's Life in brief: She was born in Rye, East Sussex, into a family of writers, including her father, Conrad Aiken (who won a Pulitzer Prize for his poetry), and her sister, Jane Aiken Hodge.She worked for the United Nations Information Office during the second world war,and then as an editor and freelance on Argosy magazine before she started writing full time, mainly children's books and thrillers. For her books she received the Guardian Award (1969) and the Edgar Allan Poe Award (1972).Her most popular series, the "Wolves Chronicles" which began with 'The Wolves of Willoughby Chase', was set in an elaborate alternate period of history in a Britain in which James II was never deposed in the Glorious Revolution,and so supporters of the House of Hanover continually plot to overthrow the Stuart Kings. 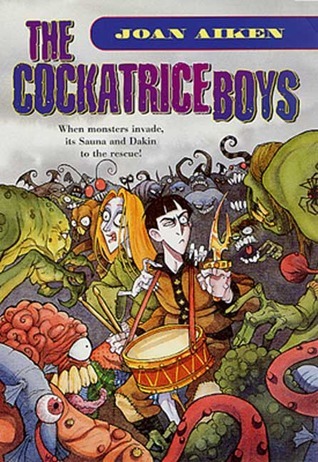 These books also feature cockney urchin heroine Dido Twite and her adventures and travels all over the world.Another series of children's books about Arabel and her raven Mortimer are illustrated by Quentin Blake, and have been shown on the BBC as Jackanory and drama series. Others including the much loved 'Necklace of Raindrops' and award winning 'Kingdom Under the Sea' are illustrated by Jan Pieńkowski.Her many novels for adults include several that continue or complement novels by Jane Austen. These include 'Mansfield Revisited' and 'Jane Fairfax'.Aiken was a lifelong fan of ghost stories. She set her adult supernatural novel The Haunting Of Lamb House at Lamb House in Rye (now a National Trust property). This ghost story recounts in fictional form an alleged haunting experienced by two former residents of the house, Henry James and E. F. Benson, both of whom also wrote ghost stories. Aiken's father, Conrad Aiken, also authored a small number of notable ghost stories.